Interferons are a family of proteins and glycoproteins that have a variety of biologic actions. Interferons were first discovered in 1957 and several clinical trials have been conducted since then to unravel the action and clinical applications of different types of interferons. This paper reviews the mechanism of action and clinical uses of different types of interferons. The past three decades have witnessed great advances in the field of diagnostic imaging. Many of these advances have greatly facilitated the diagnosis and treatment of a number of maxillofacial disorders. These modalities while employing different physical principles, are often complimentary, providing valuable information about different aspects of a given disease process. Computed Tomography, 3-D Computed Tomography, and Magnetic Resonance Imaging are some such valuable adjuncts, which have opened new dimensions in the diagnosis of maxillofacial disorders. Our understanding of the temporomandibular joint dysfunction has identified a myriad of causes for this condition. However, the outstanding concern and priority of treatment procedures are generally the same. It is a traditional procedure for the therapist to discover the cause of the pain and dysfunction of the temporomandibular apparatus and then to correct it. This paper describes acupuncture as one such simple and effective treatment modality for managing pain associated with temporomandibular disorders. Osteosarcoma is a common malignant lesion of the long bones and occurs rarely in the jaw. In comparison to the mandible it is a rarity in the maxilla. 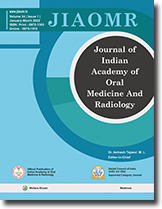 Diagnosed based on the radiographic and histologic findings, jaw osteosarcoma has an increased 5 year survival rate and low incidence of metastasis as compared to that of the long bones. Patients with jaw osteosarcoma can be remarkably treated with a combination of surgery and chemotherapy. One such case of a maxillary osteosarcoma is presented here. Ameloblastomas constitute approximately 1 percent of all cysts and tumors of the jaws. The occurrence in the mandible is four times higher than in the maxilla; in the mandible there is a predilection for the molar-ramus area with a little more than two-thirds occurring in this region. The tumor is relatively uncommon anteriorly. The average age of occurrences is in the third or fourth decade. They can grow quite large without metastasizing. The selection of treatment for an individual ameloblastoma depends to a large extent on its clinical type i. e. whether the tumor is a typical intraosseous solid or Multicystic ameloblastoma with poorly defined margins. Other factors of importance are its location in the jaws and its size, the age of the patient and patients availability for follow up examination. Face is an important landmark and any pathological condition affecting it has tremendous bearing on psychological make up of the patient. This report describes a rare case of a young female who presented with Hemifacial dysaesthesia complicated by ipsilateral masticatory complex dyskinesia. Arteriovenous malformations (AVMs) are extremely rare conditions that can result from congenital or acquired abnormalities in the structure of blood vessels. They are potentially fatal. AVMs may be asymtomatic or may show various signs and symptoms including soft tissue swellings, pain, changes in skin and mucosal colour, erythematous and bleeding gingiva, bruit and paresthesia. Radiographically, there are no pathognomic features. The present case illustrates an AVM in a 25-year-old male with history of trauma to mandible and no characteristic signs (except a swelling) suggesting AVM. Myiasis refers to invasion of living tissue by the larvae of certain species of flies. Myiasis occurs as a result of female flies depositing eggs or larvae on open wounds or on the orifices of the body or larvae being accidentally ingested through the contaminated food. This case represents very unusual condition of 40 year old female treated with radiotherapy and developing cutaneous myiasis, who was operated for carcinoma of buccal mucosa left side with maxillary sinus involvement.